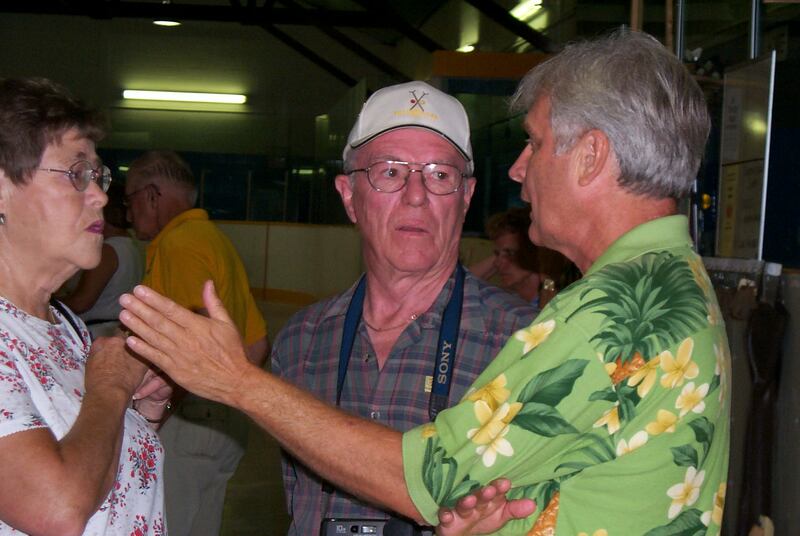 Pic FromThe Past; Pic of Grace Pipher, Alf Primeau, and Earl Ball. Taken in 2006. BEST PICTURE I HAVE EVER TAKEN!! QUALIFER: Best Pic I ever took UP UNITL 2006!! Look at this pix!!! Look at the expression radiated by each of the subjects!!! Earl, as ever in control, as evidenced by his outstretched hand, as if to say, hold it, I have a point to make and you must listen; his greying senior like hair in support of his apparent wisdom ~~ even with his absolutely outlandish shirt!! Finally we have Alf, seriously and intently engaged!! Is that intellect in his expression?? His training as a journalist is telling him: “Keep an open mind, listen to what Earl is saying; it may be something we can report! !” IF EVER THERE WAS A PIC WHICH PERSONIFIED THE generally accepted statement “A PIC IS WORTH A THOUSAND WORDS, IT IS THIS ONE”!!! Do you have an opinion about this Pix??? Do I have it “all wrong”??? Why not send along your perception, your interpretation; let’s give some balance to this creative “artsy like” discussion?? Send comments to THE SHUFFLER. We will print it and it just may earn you a Cap, not just any Cap, but a coveted SHUFFLER CAP!! 2 Responses to Pic FromThe Past; Pic of Grace Pipher, Alf Primeau, and Earl Ball. Taken in 2006. Looks like the photo was taken in an arena somewhere in Ontario. Might it have been Blackstock? ? or London ?? or Goderich? ? Yes the expressions tell it all. Earl was making his point BUT was about to get an ear full from Grace. London ON. Good Rationale Gary!! !